Medford is a lot like coming home. Much like the way you care for your own family, our staff is committed to meeting the special needs of our residents. In fact, this attention to personal care is what sets Medford and the other nursing centers of Wilson Senior Care apart from the rest. We know that you and your family will appreciate just how much like home our centers are. Operated under the auspices of Wilson Senior Care, Medford is an 88-bed skilled nursing facility offering 24-hour skilled and intermediate nursing care. Our residents have access to a complete range of healthcare services, including personal visits from physicians and other healthcare providers covering a number of medical and rehabilitative services. Medford is situated on 17 acres in one of Darlington’s most desirable residential sections. We’ve taken steps to assure that Medford is comfortable, bright and cheery. To add a personal touch, we encourage our residents to decorate their accommodations with their own familiar furniture and décor. Residents also can enjoy cable television and a personal telephone in his or her room. 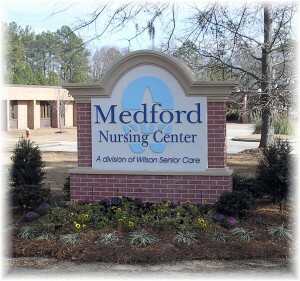 From the moment you visit or enter, you will see why our residents consider Medford home. Flowers adorn our common areas which also are bursting with natural light from large windows. A short walk down any hallway will reveal the attention to detail we take in making our residents feel right at home. Medford is conveniently located in a quiet residential section of Darlington graced with towering oaks and historical homes. And Darlington’s shopping areas are within walking distance only a few blocks away. We have taken steps to assure that Medford is clean, comfortable and home-like. And to add a personal touch, we encourage our residents to decorate their accommodations with their own familiar décor. When visiting Medford, you quickly realize that our staff members truly love what they are doing. They understand and appreciate the special needs of nursing center residents, and they’re always working toward enhancing their wellness and happiness. Working together day after day, Medford residents and employees develop a special bond. There is a mutual feeling of respect and interdependence. That creates a warm, family-like environment.